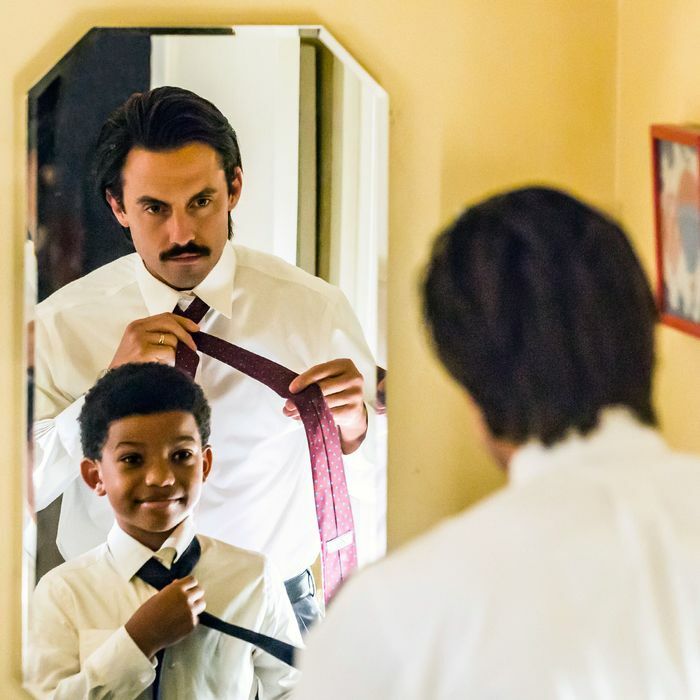 There is no shortage of character tropes in NBC’s new series This Is Us: the fat girl with a heart of gold who secretly has Cyndi Lauper pipes; the pretty white boy actor who moves to New York to do theater; the black mother at the pool who tells the white adoptive mother of a black child that she needs to find a barber who knows how to cut black hair. What’s not as entirely prescriptive, though, is the birth-parent-reunion story line of Randall (Sterling K. Brown), the black adopted son of Jack (Milo Ventimiglia) and Rebecca (Mandy Moore), and the motivation behind finding his biological father, William (Ron Cephas Jones). Randall’s birth mother is a crack addict and dies, one is led to believe, from an overdose; his birth father, also a crack addict, doesn’t know what to do with their newborn son so, as Randall tells his wife, Beth (Susan Kelechi Watson), “He left me in front of a fire station because he couldn’t think of anything more cliché.” (I can’t help but delight in the notion that the very brilliant Sterling K. Brown, who plays Randall with just the right measure of humor, vulnerability, and quiet agony, delivered that line with a side eye toward white show creator Dan Fogelman. You really couldn’t think of a better backstory for the show’s main black character?) But where the story goes from here is when things start to feel super-real. At least for me, a black adoptee raised in a white family. For black adoptees raised in white families, our black birth parents are kind of like Kunta Kinte — the allegorical ancestor supreme that connects us to the glorified motherland of our blackness. We may harbor resentment toward them at various points in our lives, but there is nothing and no one that can reach into that emotionally fraught concoction of both primal and cultural severance and pull out some kind of solace. DNA and genes are one thing — Rebecca tells Jack early on when she’s having trouble bonding with Randall, “I grew the other two inside of me, he feels like a stranger” — but add to that the historic and presumed assertion that white people can, will, and should decide the fate of black people, and love is just not enough. Obviously, there are exceptions, but white parents raising black kids often think they know what it means to raise black kids — “If I say I’m raising a black child, I’m raising a black child, and he/she is mine,” as Rebecca later intones — when it’s so much more fraught than that for the children. My own birth father, who was living at the Salvation Army in Cambridge, Massachusetts, when I found him, likened my adoption to slavery within five minutes after we met: “Taken from me and given to white people just like slavery.” And even though I couldn’t immediately relate to this man who stood in front of me, round face and glistening brown skin, midsection stuffed into a red nylon track suit, eyes bleary and soft — nothing like the slender, dashing, Stokely Carmichael–esque looking man in the one photograph I had of him — I couldn’t turn away, just like Randall when he tried to leave his father’s apartment. Rather, Randall turns and says, as if the words just fell out of his mouth: “Want to meet your grandchildren?” That’s what the pull feels like: a marrow-deep draw that is simultaneously familiar and foreign. There are glimmers of honesty on the show, too, in watching the flashback scenes, where Rebecca and Jack struggle with how to raise a kid of a different race. In a flashback scene when the kids are young, Rebecca applies sunscreen on Randall during a day at the pool. His white brother questions whether or not he even needs it, and Rebecca and Jack are both genuinely befuddled, until a black mother intervenes, with tips on applying lotion to Randall’s ashy knees and how to best cut his hair. Knowledge of sunscreen usage, hair maintenance, and ashy knees, though, doesn’t even begin to cover it, painful though it may have been for us (my white brother repeatedly referred to my ashy skin as “scales” when we were kids). So while it is entirely realistic for a black mother to step in on behalf of a black child whose white parents don’t appear to know how to meet their son’s basic hygienic needs (indeed, I would have benefited from one such black mother), it is also pandering to white liberals who think all they need to know in order to raise a black child is how to manage razor bump. More important is access to the language and legacy (which we long for whether we are aware of it or not; Randall keeps detailed track of how many black people he sees growing up in white Pennsylvania — he’d seen far more than I had at 8 years old), and reconciling a racial identity in a family that represents the default framework of a country that has historically hated us. It’s no surprise, then, that when Randall grows up, he marries a black woman, and is also the only of the three siblings to have children. Adoptees often need to make families that are of our bodies, and we need to make people who look like us, because it’s a lot to be the only one in the room, in the family, the town, at the pool, for your entire childhood and youth. And because for black folks, a lot of the time family is not just family — it’s freedom.